My binge watch of Continuum continues. The first season is now behind us, and it’s on to season two. You know the drill by now: truncated reviews and more than a few spoilers. 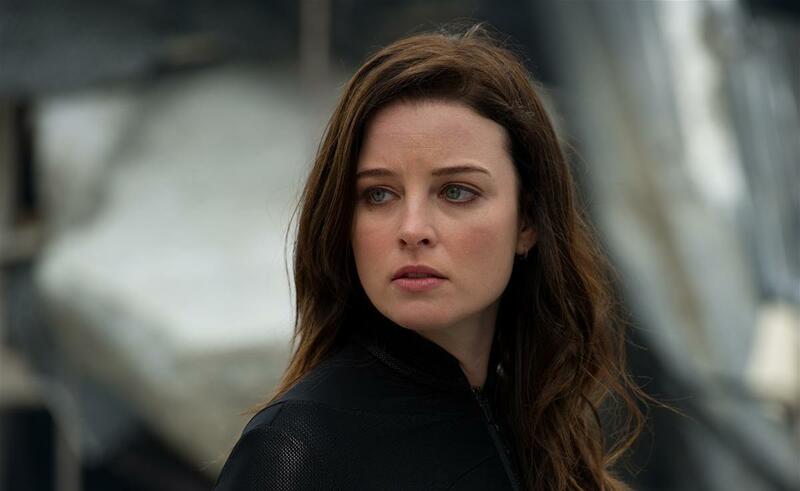 The first episode of Continuum’s second season takes place a week after the events of “Endtimes.” Kiera has gone a little rogue following the blast, Alec appears to have had a minor breakdown after reading the message from his future self, and Sonya has succeeded in her coup of Liber8 — though her authority doesn’t seem absolute. Things get moving again when the mayor of Vancouver is assassinated in broad daylight. Kiera has to get back into the saddle to investigate Liber8’s connection to the crime. The thing I found odd about this episode is that it feels like much more than a week has passed. Many characters have visibly aged, and almost all of them have changed their look in some way. I know there was actually a gap of likely several months to a year or more between filming the first season and the second, but they could have done a better job disguising the fact. Would it have been so hard to give Carlos the same haircut? Even a lot of the characters’ personalities feel as if they’ve grown and evolved more than a week can account for. With that being said, the investigation into the mayor’s death was pretty entertaining, and on the whole, this was a decent episode. I just expected better. The season two premiere may have left me a little underwhelmed, but it didn’t take long for them to get back into the swing of things. “Split Second” focuses on an attempt to transfer Travis between prisons after he proves disruptive (to put it mildly) in the general prison population. But a simple prisoner transfer turns out to be anything but. Meanwhile, Kellogg and Alec cross paths for the first time. Awesome ensues. 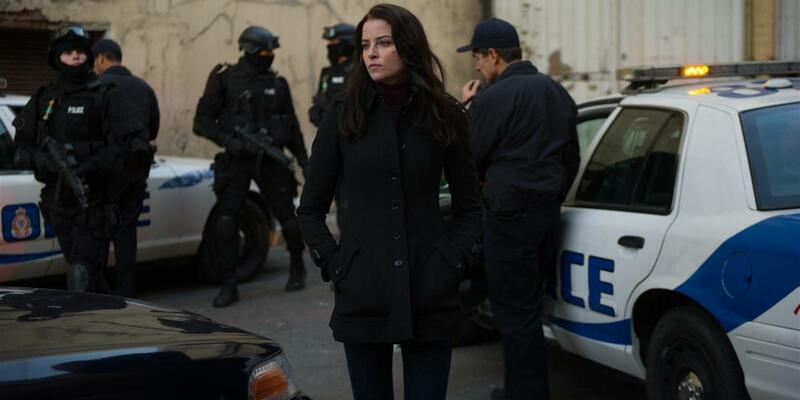 As I’ve come to expect from Continuum, there was no shortage of action and excitement in this episode. The chase through the wilderness was amazingly lavish and well-executed for a TV show, let alone a Canadian one. It was also a bit less straight forward than Continuum usually is — in a good way. “Split Second” had quite a few twists, and it kept me guessing a fair bit. I very much like the possibilities presented by this episode going forward. Everything seems to be falling to chaos in an interesting way. Kiera and Gardner are both trying to convince everyone the other is a Liber8 spy, and Liber8 has been split down the middle between the somewhat crazy terrorists, and the really crazy terrorists. While I don’t expect this to happen soon, I think this could open the door to Sonya and Lucas winding up on Kiera’s side, or at least in a semi-neutral status a la Kellogg. Of all the people in Liber8, Sonya seems the most pure of intention. She’s a true believer in the cause, whereas Travis and Garza come across as psychopaths who hide behind ideals to justify their brutality. And seriously, the subplot with Kellogg and Alec was brilliant. It’s still early going, but so far I’m starting to feel like the second season of Continuum may be an improvement over the first. 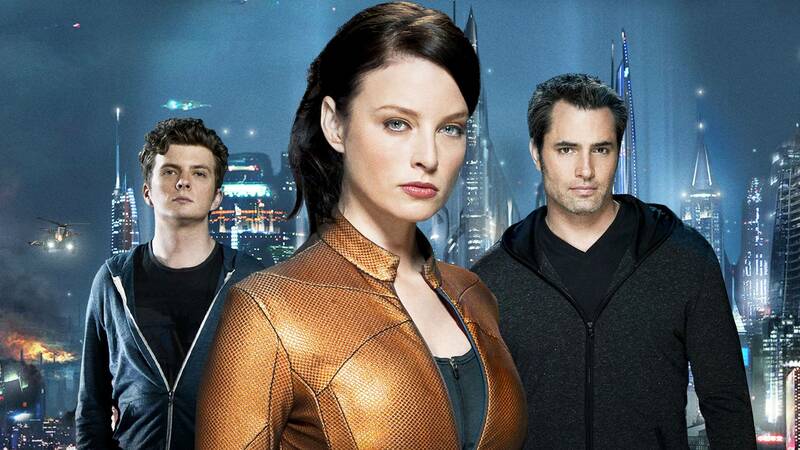 “Second Thoughts” has all the fast pacing and intensity I expect from Continuum, but it’s not quite so straight forward. It’s quite a complicated plot with a lot going on, and some pretty crazy revelations. The main plot of the episode deals with the escalating conflict between Travis and Sonya. They have made tools of Vancouver’s criminal underground, sparking a gang war that quickly sees the body count climbing. Sonya has bought their loyalty with a drug from the future, Flash, that allows people to relive memories with perfect clarity,* causing yet more chaos. Alec continues to struggle to find his path after the revelations from the future. He is tempted by both Kellogg’s offer, and by what Flash offers. And as if all that wasn’t interesting enough, Jason is back and filled with paranoia that the Freelancers are after him. Pretty much the whole episode was great, really. I enjoyed seeing Sonya’s character finally get some serious development. My read on her as a misguided idealist seems to have been accurate. Unfortunately, I don’t think her ideals are going to end well for her. 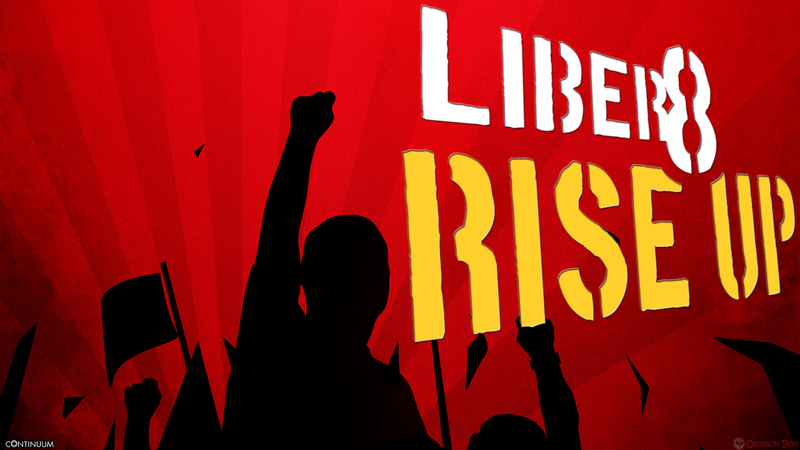 News of the Freelancers is welcome, even if we didn’t learn much. Alec’s plot might have been the most interesting, though. Jason is his father? Wow, did not see that coming. Also, I was quite glad to see Magda Apanowicz again, even if she hasn’t had any dialogue yet. She’s a very talented actress, and I’m sure her presence can only enrich this show. She looks surprisingly good with red hair. My one complaint would be that it seemed a bit weird to only now be learning about Kiera’s junkie sister. That seems like the sort of thing that should have come up before now. This episode features Kiera learning of another traveler from her own time: Her partner on the future police force. But she was thrown back much further in time, to the 1970s, and is now an old woman suffering from dementia. Their reunion stirs up a great deal of emotion for Kiera, but she has little time to dwell on her memories. Her partner’s combat suit was sold at a garage sale by her son, who knew nothing of its power. Kiera and both factions of Liber8 rush to find it, but it has already been put to use by its new owner: a random nerd who got it for sci-fi themed wedding. Once he figures out that the suit makes him nearly indestructible, he does what any self-respecting nerd would in that situation: He decides to become a super hero. “Second Skin” doesn’t do a huge amount to advance the main plot, and it isn’t on the same level of quality as the previous two episodes, but I still enjoyed it a lot. It had lots of excitement, and a decent emotional punch, too. If I had one complaint, I would have liked a clearer resolution to the story of the poor shmuck who found the suit. I was actually rather enjoying see his arc unfold. For just a minor bit character, they managed to make him feel pretty fleshed out. Kiera is having a bad day. It’s her son’s birthday… or at least it will be, several decades into the future. This makes her sense of loss over being separated from her family cut much more keenly than usual. To make matters worse, the chief of police is fired, and the entire department find itself being investigated under suspicion of housing a Liber8 mole. It’s all too much for Kiera, who goes off the deep end a little bit. Aside from putting her under even more scrutiny than she already was, this triggers an emergency psychiatric treatment program hidden in her software — played by Alessandro Juliani, AKA Felix Gaeta on Battlestar Galactica. If it can’t be satisfied of her mental health in an hour, it will erase her memories. If you’ve ever wrestled with an automated phone directory, you have an idea of how well an automated shrink works. The problem with this episode is that it focuses almost entirely on Kiera’s internal struggles, and Rachel Nichols just doesn’t have the acting chops for it. She’s good at playing the superhero; she does cool, confident, and smug very well. What she isn’t so good at is coming across as a three-dimensional human being, and “Second Opinion” is an episode devoted almost entirely to humanizing Kiera. It was also a bit distracting that Kiera apparently hasn’t grasped that because she’s in the past, her son isn’t necessarily missing her. If she ever does find a way back, she could, theoretically, reappear in the future mere moments after she left. So all her hand-wringing over how he must go to bed every night wondering what happened to her doesn’t really have the impact it was probably meant to. To be fair, Kiera’s grief over being cut off from her family is something that needed to be addressed sooner or later. It is an important part of her character. But it’s just not a story that plays to Continuum’s strengths, and prior to now, Continuum has been very good about sticking to what it does well and not wasting time on anything else. This entry was posted in Retro Reviews and tagged Continuum, review, sci-fi, TV by Tyler F.M. Edwards. Bookmark the permalink. It’s eerie for me to read your reviews and how well they track with my memory of watching these episodes. 1st half of the season was, as you review here, really good. And then it kinda tipped over…… Personally, the 2nd half of the season just didn’t do it for me at all, and that’s why I’m having trouble sticking with the show in season 3 now. I’m anticipating seeing if your reaction is different, and if so, maybe it will give me new eyes on the show and I can maybe get more into it again. It’s definitely a show I *want* to love, and I did in the beginning. No idea why I just petered out on it in the 2nd half of S2. I’m actually much farther into the season than my reviews would indicate. Been a backlog of blog topics, so it’s taking me a while to post them. Anyway, I’m nearly done season two now, and while it has lagged a little bit in the middle, so far I’m still enjoying it for the most part, and there have been a few home runs in the mix.